China’s stock market collapse in the last couple of weeks affected markets across Asia. RBTH spoke to analysts about the reasons for the free fall and whether this volatility in Chinese financial markets would affect Russia. Over the last two weeks, Shanghai’s stock market lost $2 trillion, according to a calculation by Merrill Lynch analysts. The benchmark Shanghai Composite index has dropped 30 percent since its peak in mid-June, triggering a chain reaction across Asian markets. 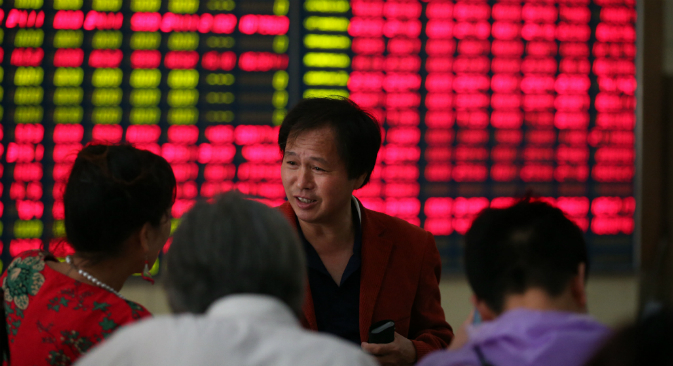 More than 500 companies have already suspended securities trading on the Shanghai and Shenzhen stock exchanges. On July 8, US investors also began selling stocks, fearing the consequences of a collapse in the Chinese financial markets and the crisis in Greece. The Dow Jones Index slid more than 1.5 percent, while the Nasdaq and S&P 500 also slumped more than 1.7 percent. RBTH spoke to analysts about the reasons for the collapse in Shanghai and whether this would affect Russia. Russian analysts say the current sell-off in China is connected with a bubble that was caused by extremely rapid growth. Evgeny Gavrilenkov, Chief Economist at Sberbank CIB, believes that the Chinese market was really overvalued. “The Shanghai stock market index (before the recent correction) rose from around 2000 to over 5000, that is more than 2.5 times since mid-2014,” Gavrilenkov told RBTH. “Clearly it was not justified by any fundamentals. Even the current value of around 3700 may be too high." “The Chinese market is falling because it grew by 150 percent before that,” says Sergey Danilov, Managing Director to the BCS Premier financial group. “A lot of Chinese stocks became more expensive than their American peers on the basis of general price multipliers.” He adds that the Chinese market is witnessing a correction. The volatility in the Chinese stock markets has caused a fall in oil prices, hence affecting Russia indirectly, Russian Finance Minister Anton Siluanov said on July 8. According to him, this also affects the Russia’s balance of payments and, consequently, puts additional pressure on the ruble. According to Siluanov, the Central Bank’s currency purchases negate all the changes in oil prices, which are likely to occur in the near future. “By buying hard currency, the Central Bank forms a buffer that can be used to support the ruble in case of oil or other external shocks,” Maria Pomelnikova, Analyst at Raiffeisenbank in Moscow, told RBTH..
Sberbank CIB Chief Economist Gavrilenkov says the effect of the Chinese stock market crisis on the Russian economy will indeed be minimal as there is little difference for the Russian economy if oil is priced around $57 per barrel (the current price) or around $60-65 per barrel as it was in May-June. “Moreover, it is hard to accurately separate the impacts of the Chinese market correction and the Greece saga on oil prices,” he adds. According to Pomelnikova, the fall of the Chinese stock market is reflected in Russia’s economy most visibly through the reduction of oil prices and metals prices, which leads to a further reduction of exports and devaluation of the ruble. “For the global economy, the stock market is less important than the slowdown in China,” says Anton Tabah, Director of the regional ratings agency RusRating. He adds that the IMF projected that China will give way to India in terms of being the world’s fastest growing major economy. This will affect the prices of oil and raw materials, as China spends less, but oil prices would rebound thanks to increased infrastructure spending and growing domestic consumption worldwide, according to Tabah.